Finished installing the light fixtures we bought. The one pictured for today is in the parlor. It is a double kerosene lamp that hasn’t been electrified. Since there wasn’t a ceiling fixture in the parlor anyways, we decided to leave it as a kerosene fixture. Could come in handy during those rolling blackouts. 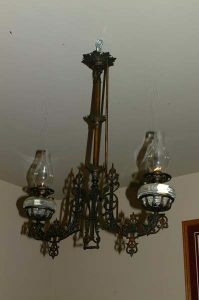 Eventually we want the parlor to be a museum room, so it will be cool to show it of with true period lighting.